SHOWS: VIENNA, AUSTRIA (MARCH 19, 2019) (REUTERS - ACCESS ALL) 1. MARCEL HIRSCHER POSING WITH CRYSTAL BALLS REPRESENTING WORLD CUP TITLES AND GOLD AND SILVER MEDALS FROM WORLD CHAMPIONSHIP 2. CLOSE OF WORLD CUP TROPHIES 3. (SOUNDBITE) (German) AUSTRIAN SKI CHAMPION MARCEL HIRSCHER, SAYING: "Total commitment is needed both from both the physical and mental side and if I feel this isn't there, then I simply can't make it. You know I'm used to competing for the the big (crystal) balls and that is also the goal, but for that you really need 100 per cent." GRANDVALIRA, SOLDEU, ANDORRA (MARCH 17, 2019) (REUTERS PICTURES - ACCESS ALL) (MUTE) 6. MARCEL HIRSCHER IN ACTION 7. MARCEL HIRSCHER ON PODIUM WITH THREE CRYSTAL BALLS AWARDED FOR WINNING OVERALL WORLD CUP AND BOTH SLALOM TITLES VIENNA, AUSTRIA (MARCH 19, 2019) (REUTERS - ACCESS ALL) 0. 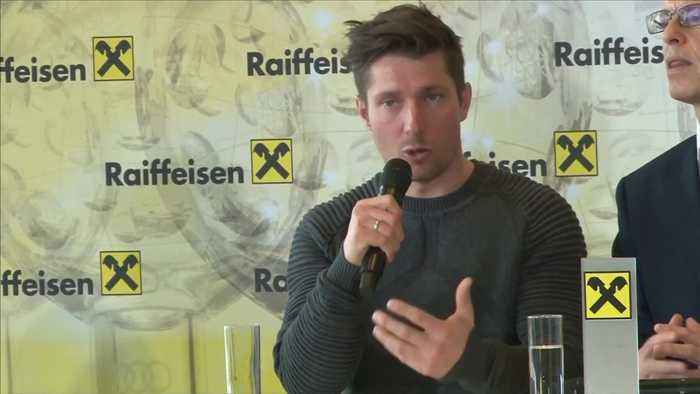 (SOUNDBITE) (German) AUSTRIAN SKI CHAMPION MARCEL HIRSCHER, SAYING: "I believe in every relationship it is about joint decisions and this is, after all logically, a life decision. We know, or at least all those with families know what burden it is when a part of it is away for days on end. It is always a joint decision and I'm glad about it." PYEONGCHANG, SOUTH KOREA (FEBRUARY 18, 2018) (REUTERS - ACCESS ALL) 10. AUSTRIAN SKIER AND OLYMPIC GOLD MEDALLIST IN GIANT SLALOM AND COMBINED WEARING HIS MEDALS 11. HIRSCHER POSING WITH GOLDEN HEART AND GOLD MEDALS STORY: Austrian star Marcel Hirscher, who has dominated Alpine skiing over the last eight years, said on Tuesday (March 19) that he will soon decide whether to continue his career. Just two days ago in Soldeau, Andorra, Hirscher was on the podium to receive his eighth successive World Cup overall title. Hirscher told a news conference in Vienna that he needed to find out whether he still can deliver the "total physical and mental commitment" required for winning and will discuss it with his coaching staff, sponsors and family before deciding. The 30-year-old has also won two Olympic golds at Pyeongchang, South Korea in 2018 in combined and giant slalom as well as seven world championship golds, the most recent being earlier this year in Are, Sweden.